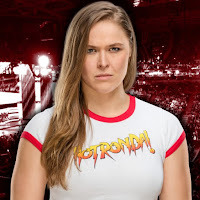 - Ronda Rousey made a televised appearance on RAW this week, and it saw her taking out Absolution after they tried to recruit her as a new member. Kurt Angle and Rousey were in the ring to hype up their Wrestlemania 34 match and talked about the obstacle ahead before Absolution came to the ring. Paige said Rousey could use some backup, but Ronda declined, so Paige sent Sonya and Mandy after her. Ronda ended up taking both out rather easily, and Angle had to beg Ronda not to break Mandy’s arm after putting her in a grounded armbar. - The enhancement talent who was squashed by Asuka on tonight's WWE RAW from Cleveland was women's wrestler "Platinum Aggressive Lady" Ellie Fredricks, who also manages on the indies. She used the name Jamie Frost on her WWE TV debut. You can find her on Twitter at @EllieFredricks_. Below is video from tonight's match.